The Soros Fund Management opened up smallish positions in the mid-cap biotechs DexCom and AnaptysBio in the most recent quarter. Billionaire George Soros' namesake fund, Soros Fund Management, has consistently beat the broader markets over the past 40-plus years. The fund's quarterly buys and sells are therefore must-read material for any serious investor. What was the fund buying in the fourth quarter of 2017? In the high-growth biotech space, the fund initiated new, albeit modest, positions in both the diabetes device maker DexCom (NASDAQ:DXCM) and the clinical-stage drugmaker AnaptysBio, Inc. (NASDAQ:ANAB), according to the latest 13F filings with the U.S. Securities and Exchange Commission. Should investors take a cue from this elite money management firm and buy these two biotech stocks? Let's dig deeper to find out. Time to buy this falling knife? DexCom is a top player in the relatively new field of continuous blood glucose sensing devices. Its once high-flying shares, however, have been in a tailspin over the last few months -- thanks to the FDA approval of Abbott Laboratories' (NYSE:ABT) competing FreeStyle Libre System and its subsequent coverage by Medicare and Medicaid. As Abbott's continuous glucose monitoring device is both cheaper than the G5 Mobile and doesn't need to be calibrated, DexCom's G5 Mobile system is clearly at a competitive disadvantage at this point. So it's not entirely surprising that investors are growing more and more concerned about DexCom's future growth prospects. Despite this new competitive threat, however, DexCom's sales are still expected to climb by an impressive 18.7% to $846 million this year. The company is also on track to reportedly launch its own "no-calibration" G6 continuous glucose monitoring device later this year, and its G5 system did reportedly outperform Abbott's FreeStyle Libre System in terms of the time required to detect hypoglycemia in people with type 1 diabetes in a head-to-head study earlier this year. The downside is that DexCom's shares remain on the expensive side even after this latest pullback. The company's trailing price-to-sales ratio, for example, currently stands at a sky-high 7.32. So you have to be willing to pay a fairly sizable premium if you want to buy into DexCom's supercharged growth story. Can this rocket-like trajectory continue? AnaptysBio's shares have quadrupled in value in the just the past 12 months. The catalyst? Investors are apparently excited about AnaptysBio's experimental atopic dermatitis (eczema) candidate ANB020. This clinical-stage drug works by inhibiting the cell signaling molecule interleukin-33, which is known to play a key role in numerous inflammatory disorders. Recently, the company reported overwhelmingly positive results for ANBO20 in a small mid-stage study in adult patients with moderate-to-severe atopic dermatitis. And based on this encouraging outcome, AnaptysBio is planning to evaluate the drug's safety and efficacy in a much larger mid-stage study for atopic dermatitis later this year. The company is also currently assessing ANBO20 in adult patients with peanut allergies and eosinophilic asthma. The big idea, if you will, is that ANBO20 may be able to grab the lion's share of the $4 billion skin disorder market if it proves to be as potent as advertised. That's a tall order for any experimental anti-inflammatory drug, but the initial results do appear to back this claim thus far. Are either of these biotechs worth buying right now? 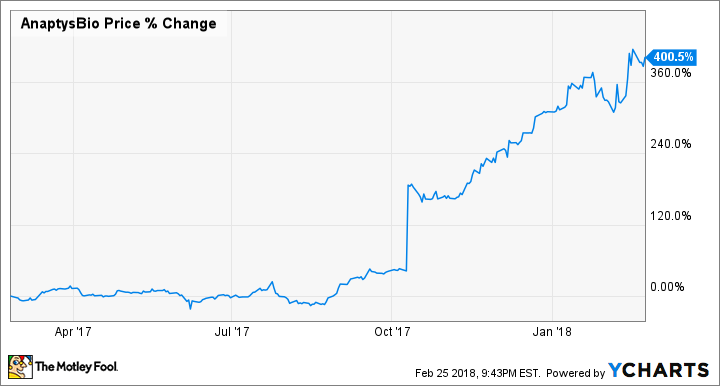 DexCom and AnaptysBio both have incredibly enticing long-term growth trajectories, but they also come with a hefty dose of risk. After all, there's no guarantee that DexCom can continue to grab market share in an increasingly competitive space, and the company will also have to constantly innovate to stay ahead of the field. AnaptysBio, for its part, still has a lot to prove in terms of the efficacy and safety of ANBO20 -- its most valuable product candidate. No matter how profound, small mid-stage trial results should always be taken with a rather large grain of salt. What's the verdict? These two mid-cap biotech stocks might be appealing to risk-tolerant investors on the hunt for unusual growth opportunities. But conservative investors should probably keep their distance because of their highly uncertain outlooks.